The Inns at St. Albans Chef D. Scott Phillips serves up hearty American comfort foods in a rustic European setting on the Missouri River. Buttermilk pan-fried catfish paired with chive French toast. Caramelized leek stuffed French toast wtih braised short ribs. Cajun French toast with caramelized Fuji apples and caramel sauce. The Inns at St. Albans is that rare little getaway city-dwellers can discover practically in their own backyards, the type that offers respite in a setting that might as well be half a world away. It’s a scenic spot for a bunk and a bite, so to speak, though it’s the eats that are keeping Chef D. Scott Phillips on the map. The bed-and-breakfast inns and events facilities lie in the village of St. Albans, MO, just a few minutes drive from Chesterfield on the Missouri River. The peaceful grounds are home to the Old Barn and the Studio Inn, built in 1843 and 1900, structures have served as a stopping point for travelers, as well as a couple of restaurants through the decades, most recently the Gardens at Malmaison. Today, the newly renovated buildings host private parties, catered events and overnight guests, eager to absorb the European-inspired elegance of a half-dozen well-appointed rooms. 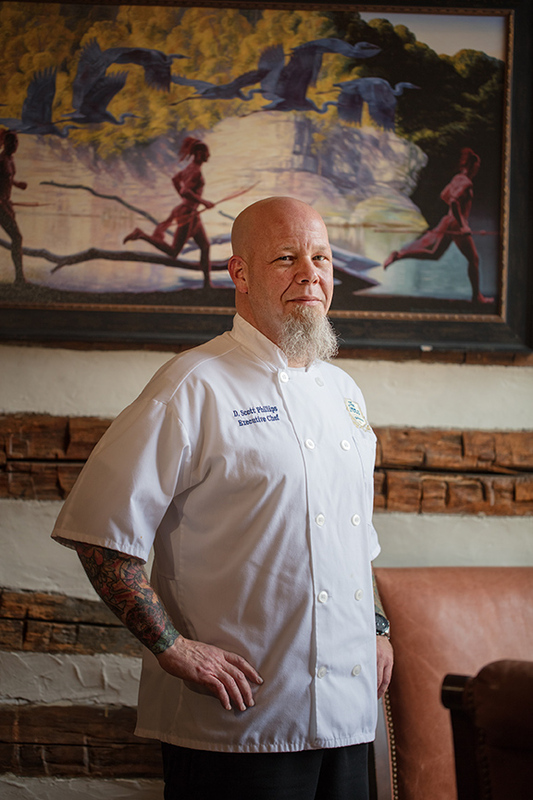 Manning the kitchen is D. Scott Phillips, a versatile chef who made his name at establishments such as Provisions Gourmet Market and Balaban’s. 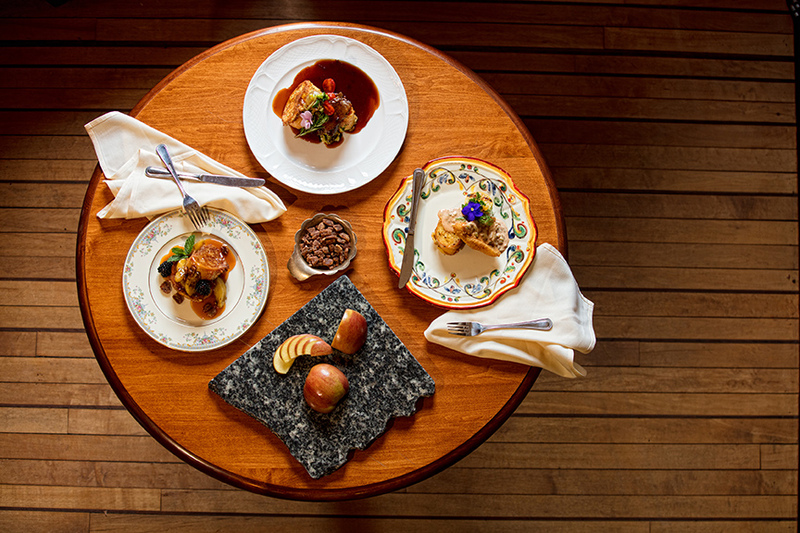 While catering for hungry crowds of various sizes and transporting food to outside venues present challenges, Chef Phillips offers a striking level of variety to his on- and off-site diners. 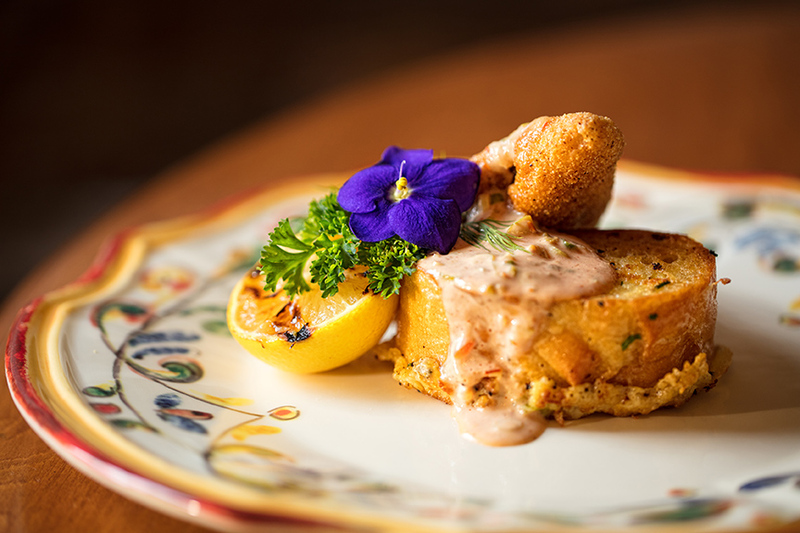 His custom menus accommodate a range of tastes, whether the customer’s keen on a brunch of egg stratas and pain perdu, or hankering for the kick of Cajun fare. “I tell people there’s nothing I can’t do, but I like to keep it simple,” he says. “Simple” means satisfying comfort foods like pot roast, meatloaf and Phillips’ fried chicken, which the chef proudly touts as the best around. The popularity of the fried chicken inspired Phillips to introduce accompaniments that are familiar, yet deviate from the expected: French toast. “I thought it would be fun, since we see a lot of chicken and waffles,” he says. “Everyone’s doing chicken and waffles.” Both sweet and savory French toast creations populate his guests’ menus, partnered with everything from roasted apples to braised ribs. One doesn’t need to cater an event to tuck into a hearty meal at the Inns at St. Albans; Phillips serves his Sunday Supper buffet of comfort food each week from 4-8 p.m. (think fried chicken, pot roast or meat loaf, for example, with sides like macaroni and cheese, green bean and whipped potatoes), all for a respectable $20 per person. Chef D. Scott Phillips from The Inns at St. Albans will offer three unique takes on classic French toast at the April Cooking School on Wednesday, April 5, from 6:30-8:30 p.m. at Ferguson Bath, Kitchen and Lighting Gallery. The cost is $35 per person. For reservations, call 636-230-9640, ext. 27, or email [email protected]. Seating is limited. Caramelized Leek Stuffed French Toast: For this savory French toast, Phillips drenches French bread in egg, cream and chives and stuffs it with creamy mascarpone, caramelized leek and onion. 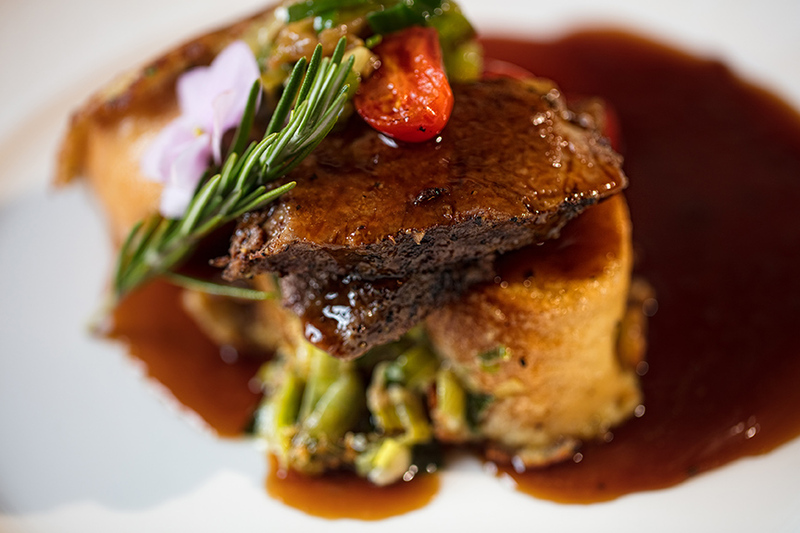 It’s served alongside a beef short rib that’s braised in a reduction of Missouri’s signature Norton wine. Wine pairing: Cachette Cotes du Rhone. Buttermilk Pan-Fried Catfish Paired with a Chive French Toast: The same savory French toast describe above is piled with cornmeal-coated catfish. Phillips tops it with briny capers and olives, and flavors it all with chili, garlic, scallions and hot sauce. He completes the dish with a drizzle of spicy aioli. Wine pairing: Georges Duboeuf Macon-Villages Chardonnay. 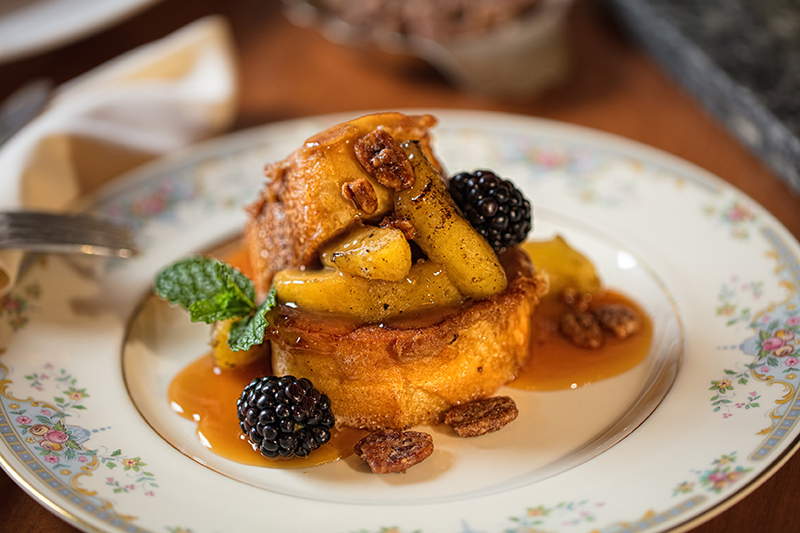 Cajun French Toast with Caramelized Fuji Apples and Caramel Sauce: Though this recipe starts traditional, it goes a step beyond with the addition of cayenne pepper and bourbon to the egg dip. Phillips tops the confection with caramelized Fuji apples and fresh-made caramel sauce. Wine pairing: Gustave Lorentz Brut Rosé.